The draw means Lyon have dropped back out of the top three, dropping two places and letting Nancy skip three points clear. With every match, a winning run inevitably draws nearer to its end, and after four wins on the trot for Alain Perrin’s men, the visit of Lille to the Stade Gerland broke OL’s winning streak and reminded everyone how hard it it is to battle simultaneously in the Champions League and the Ligue 1. The proverb is well known, whether it be in horse riding, cycling, or even football… after a fall you have to get straight back in the saddle. Perrin started with eight of the starting XI from the Camp Nou, with Cleber Anderson coming into the centre of defence, Fabio Grosso on the left and Kader Keita on the right wing, relegating Réveillère, Belhadj and Källström to the bench. After a quality team move, Mathieu Bodmer forced Tony Sylva into a smart double save (3’). The former Lille player was back in the midfield and he called Sylva into action in the 13th minute, without any more success. 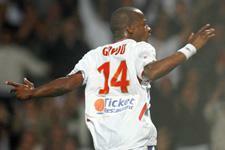 Keita then shot wide (16’) and Juninho and Co were unable to cover themselves against the frequent Lille counterattacks. Obraniak couldn’t hit the target for the visitors from 20 metres out (7’) and then, from a corner cleared by François Clerc, Michel Bastos beat Rémy Vercoutre with a powerful shot inside the left post (18’). Full of confidence after opening the scoring, the Brazilian Bastos tried his luck again from distance (32’) before Obraniak saw his effort pass agonisingly wide of Vercoutre’s right-hand upright (33’). Controlling possession, Lyon mounted pressure on the Lille goal, without ever creating a clear-cut chance. Sidney Govou failed to force Sylva into a save after a neat one-two with Benzema (32’), and the France forward then found the North Stand with a bicycle kick from the edge of the area (41’). From long range, Benzema and then Grosso did likewise (34’ and 41’). At the start of the second half, Bastos’ early efforts (46’ and 52’) suggested a difficult 45 minutes for the champions. But it was to prove otherwise. Les Lyonnais restricted their guests to just two further efforts, both off target, from Cabaye (67’) and Touré (80’). From a Juninho cross, Bodmer forced Sylva to punch clear (48’). Aware, as always, Sylva the denied Benzema (53’). However the Senegal ‘keeper could do nothing to prevent Govou’s equaliser. After beating Tafforeau, the OL No.14 toe-poked home to square the scores (58’). With half an hour left, Lille were pushed onto the back foot, but OL were unable to produce the winning goal. Keita’s shot flew wide (69’). Baros saw two goals correctly disallowed for offside (85’) and hand ball (86’). And right at the end of the match, Sylva denied Benzema (88’) and Baros (90’). Lyon’s desire and ambition wasn’t enough to claim all three points. But, just days after their Barcelona experience, their second half reaction was certainly reassuring. In a week’s time they’ll be back at the Stade Gerland to host Lens in the rescheduled Week 3 fixture. With a full week to prepare, the champions embark on a big week with the visits of Les Sang et Or and Glasgow Rangers and then the trip to Bordeaux… Bring it on!